Heather here this week. I got several books in the mail, check them out. 1. Me, Myself and Why? by MaryJanice Davidson – I picked this book as my first “Waiting On” Wednesday post and it finally came out last Tuesday. This is the first in a trilogy starring Cadence Jones, a federal agent who has multiple personality disorder. She and her field office of people like her are on the hunt for a serial killer. I’m really looking forward to reading this book. 2. Torment, Torment, and Fallen by Lauren Kate – You’re wondering why I have 2 copies of Torment and 1 copy of Fallen? 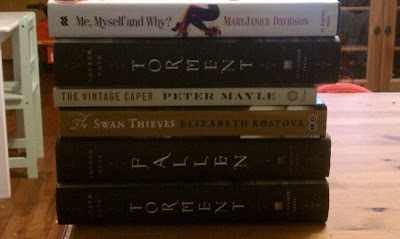 One copy of Torment, which came out last Tuesday as well, is mine. The other copy of Torment and Fallen are for Danny. Pushy and I will be attending a book signing by the author at a fantastic local indie book shop in a few weeks. Since Danny lives out of the U.S. and few authors travel to her country for signings, I’ll get some signed for her. 3. The Vintage Caper by Peter Mayle and 4. Swan Thieves by Elizabeth Kostova – I belong to QPB and forgot to reply that I didn’t want these books, so they showed up in my mailbox. The Vintage Caper has some mixed reviews on amazon.com and is about a heist in California of vintage wine. Swan Thieves is historical fiction about a psychiatrist and a painter patient of his. This also has mixed reviews on amazon.com. 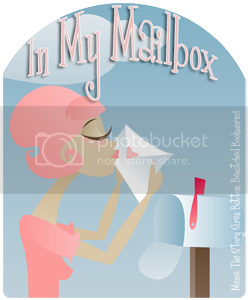 Have you read any of the books I got in my mailbox last week? What was in your mailbox last week? « These books are banned?Oooh! Let’s read them!! That is so cool that you get an extra copy signed for Danny! I wish I had made it to Lauren Kate's signing near me, but I worked both nights that she was close to my home town! I've heard great things about Peter Mayle's books, too! Enjoy these! Torment is on my wishlist. You've got great books. Happy reading! My recent post Reviewers Needed! Squeee !! There are my copies!!! I'm so sooo happy to have pushy and Heather to go to so many book signings and always get some for me.. 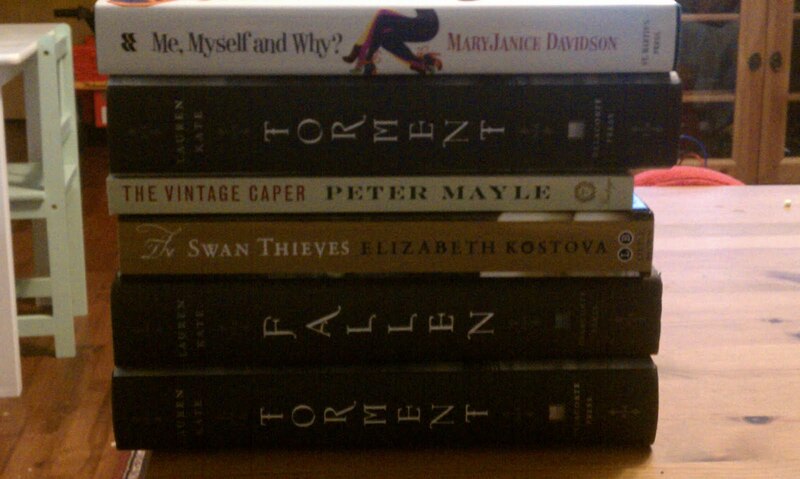 I'm extremely excited about the Fallen and Torment copies. I have them both on my Kindle but I adore the covers and so I sked the girls to get them both signed for me! Great mailbox, I also got "Me, Myself and Why". And yay that Danny will get her books signed. Fab books this week. Hope you enjoy them! My mailbox is here. I just went to a book signing here featuring Lauren Kate! Very nice lady. Hoping to get a post up a little later today…. You have great reading to look forward to! My IMMB is here Have a great weekend! Yet another book I need to look for.